A twisted, ugly, raw emotion churning experience. W hile I had Seed sitting on my Kindle for a while, I did not plan on reading until I saw the glowing recommendation by one of my fellow UK Book Blogger. She urged me to pick it up and I admit I'm grateful that she did. It also took me a while to write a review for Seed as the book left my thoughts disarrayed and scattered. I will only give a vague premise as I strongly believe even a small detail can be spoilery. So Pearl lives in a farm called Seed, with her family. She is home schooled and and worships nature with their leader Papa S. Seed and it's life is what Pearl know until one day there are new comers who bring new scenarios and new questions with them. I'm purposely being vague here as this book is something which should be gone into as blind as possible and the way things get revealed is half the fun. Pearl's life seems perfect to her and at first she hates the newcomers who bring uncertainty with them. 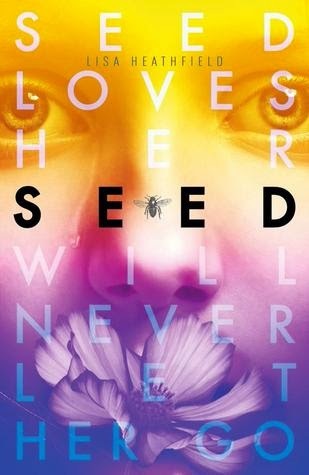 The relationships between the people in Seed kept me on my edge of my seat. The whole set up so weird and twisted but reading from Pearl's point of view, it seemed the other way around. Ellis and his family bring the much needed change and then events starts unfolding rather quickly. Some of them are sweet while some of them were horrifying. What I loved most about Seed was how there were different dynamics between each family member and how skilfully Lisa Heathfield manages to capture ever glare and glances which are telling yet leaving me asking me for more clarification. The author is a master of 'showing not telling' which gave so much depth to this book. The ending is what left me utterly gobsmacked. I wasn't sure if I wanted to applaud or scream at my Kindle for the ending. I may warn you it felt like a cliff hanger to me. This book is highly recommended to YA readers who want to try something new bored with the regular dystopian, contemporary romance, or fantasy. It was twisted, ugly, raw, emotion churning experience which I definitely want to repeat again and again. Do yourself a favour and try this book. Review based on a copy received from the publisher via Netgalley.